Couldn't be simpler than this. 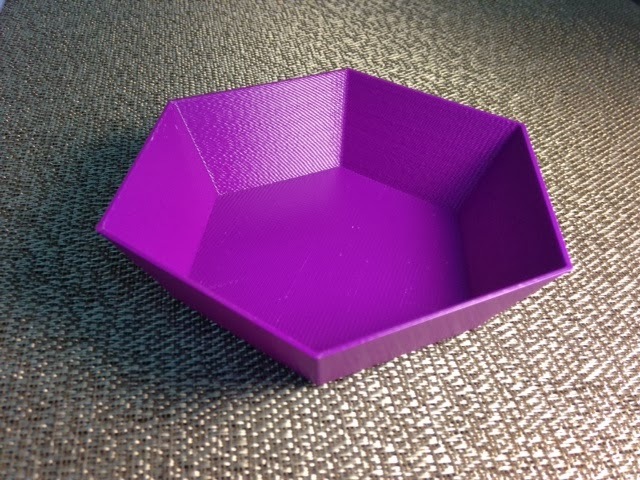 Needed a bowl, threw down Marissa's "wedge" shape script in Tinkercad, printed it as a shell on the Afinia. Settings: Afinia 3D software with .3mm default fast and "shell" setting. This causes only the bottom, sides, and top to be printed, and I stopped the print just before it got to the roof. Technical notes: This was also a test of Sain Smart purple filament in the Afinia. It works fine but there are two things to note: First, the print is shiny almost like it was made of PLA instead of ABS. Second, this filament definitely gave off more fumes/smell than the usual Afinia premium and value line filaments. Perhaps I need to change the temperature?